With a history that stretches back thousands of years, no country on earth has more UNESCO World Heritage sites than Italy. In cities like Naples, Rome, and Venice, layer upon layer of civilization is palpable to even the naked eye. New York City, on the other hand, has the Metropolitan Opera, world-class museums, and Shakespeare in the Park. And of course, Rockefeller Center, home of the popular show 30 Rock. The Cloisters Museum was a must see for the group. 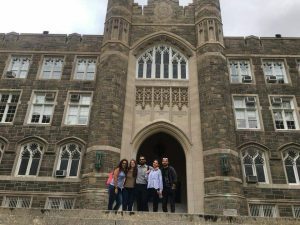 For six Italian exchange students who have been studying at Fordham since August, that’s no small matter. 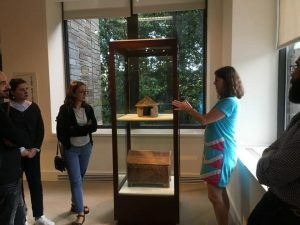 Visits to the Metropolitan Museum of Art have allowed them to take in the ways in which a young country like the United States treats items of antiquity, while living in lower Manhattan has brought pop culture of New York City into sharper focus. “It’s like living a dream, because we’re very obsessed with American culture. We grew up with American culture, movies, and TV series,” said Marco Cataldi, a native of Calabria, Italy. Students also visited Fordham’s own museum of Greek, Etruscan, and Roman Art. Cataldi, Simeoni and four others studying at Fordham this semester are the inaugural cohort of World Cultural Heritage Studies, a three-year long partnership between Fordham and a consortium of six Italian universities that was signed last year by Fordham president Joseph M. McShane, S.J., and Stephen Freedman, Ph.D., Fordham’s late provost. Next fall and spring, Fordham graduate students studying the humanities will likewise be invited to study at the Università di Bologna, Università di Chieti-Pescara, Università di Roma La Sapienza, Università di Roma Tor Vergata, Università di Roma Roma Tre, or Università per Stanieri di Perugia. Jo Ann Isaak, Ph.D., Fordham’s John L. Marion Chair of Art History and Music, said the goal is to emulate the European Community Action Scheme for the Mobility of University Students program. Since 1987, ERASMUS, as it is commonly known, has essentially eliminated borders for European students. “Every year, students freely come and go to other universities and attend classes and have their classes accredited in their home university. This fluidity is so important,” she said. In addition to Isaak’s class Contemporary Art in Exhibition, the Italian students are taking classes such as Urban Film Video Production by Mark Street,, Ph.D., associate professor of visual arts, and Rewriting the Mediterranean by Francesca Parmeggiani, Ph.D., professor of Italian and comparative literature and Making Early Music by Eric Bianchi, Ph.D., associate professor of music. The Italian students worked alongside their American counterparts to put on an exhibition, Art for Arctic’s Sake, at the Ildiko Butler Gallery. In August, the Italian exchange students along with Fordham graduates were treated to a two-week long immersion course that included trips to major landmarks and sites like Belmont’s Little Italy. Other Fordham students have also taken them on more informal outings, including one to Governor’s Island. 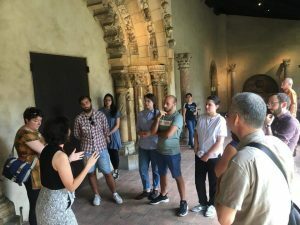 Simeoni said the Cloisters Museum impressed her because the displays there showed a level of attention to medieval objects that is often lacking in Italy. A visit to the African Burial Ground National Monument in lower Manhattan was also particularly moving, she said. “It was very shocking, seeing it. We study these things in Italy, but it seems far. 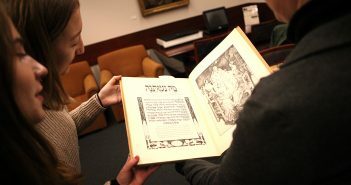 Here, I can perceive so much, and see how American people try to remember history in the right way,” she said. The students have been living at College Italia’s H2CU Residence, a complex of 15 apartments on Rector Street owned by a consortium of Italian universities, since August. 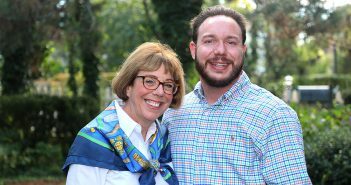 As part of the exchange, Fordham graduate students will have the opportunity to study for a term in Italy. Isaak encouraged students interested in courses such as Everyday Life in Pompeii, Philosophy of Science and Medicine, Novels as Travel Guides, and Magic in the Middle Ages in Italy to consult with their advisors and the dean’s office of the Graduate School of Arts and Sciences. 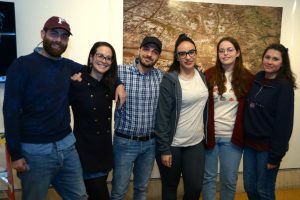 “The Italian graduate students have been really fantastic to have in my class, and I’ve been happy with the ways our own students have taken on the role of host and introduced them to New York,” Isaak said.